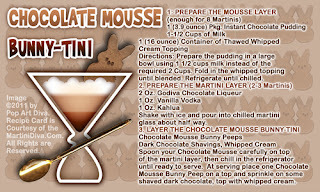 EASTER MARTINIS - Chocolate Mousse BunnyTini! This year's new Easter Martini is actually a martini and a dessert rolled into one! The Chocolate Mousse BunnyTini is a serving of delicious chocolate mousse with a little chocolate martini topping! I was inspired by the cute Chocolate Mousse Bunny Peeps I found this year in the Easter candy aisle and, of course, that little bunny Peep is the garnish topping for this unusual martini.